Tertary buckwheat F. tataricum (L.) Gaertn. Buckwheat originated in Central and Western China. It is now a relatively minor crop in the United States. Buckwheat is entirely different from other grains and is not a grass. It is a summer annual with rather coarse, branched stems and large arrow-shaped leaves. Flowers and leaves rise from the nodes on the main stem and branches. Growth is indeterminate with flowers opening throughout a long season, seed crop does not mature at one time. The seed is partially but not entirely enclosed by adhering flower parts during development. Buckwheat is usually seeded only after the ground is thoroughly warm in early summer. Plants will begin blooming 30 - 40 days from seeding and first seeds mature about 35 days later. Commercial harvesting is done when a substantial part of the seed is ripe. Fields are then mowed and plants are stacked to dry and later threshed. Seeds are pointed, broad at the base and triangular to nearly round. In most buckwheat flour some of the seed coat particles remain, resulting in a light brown color. More complete milling results in white flour. The Japanese buckwheat is most widely grown in this country. The seeds are large, brown in color, and triangular in cross section. Plants are tall, rather coarse growers with large, broad arrow-shaped leaves. Silverhull plants are smaller than Japanese with smaller leaves. The seeds are small, nearly round in cross section, glossy and gray in color. The hulls are thinner than in Japanese. Tartary buckwheat has small seeds, nearly round in cross section. Color varies from gray to black. The hull may be smooth to rough and spiny. Leaves are relatively small, narrow and arrow-shaped. Plants may be almost viney in habit. Wing-seeded buckwheat is similar to Japanese except that the hull at the angles of the seed is extended to form a wing. It is not normally planted, but may be present in mixture of other kinds. 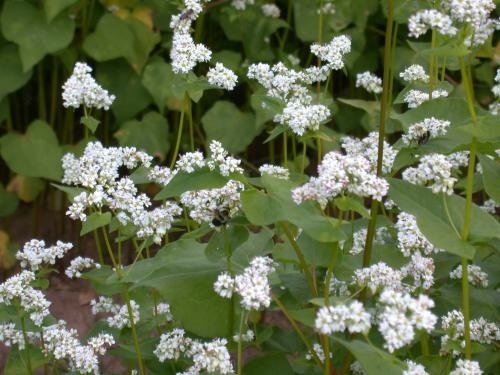 The buckwheat plant is an excellent honey source as the blossoms are rich in nectar, and blooming continues into the fall months. Some beekeepers plant buckwheat primarily for such use.